In the beginning of the 18th century, the viscount title and castle goes to the Saint-Martin family from Capbreton in Gascony. Then, around 1750, it falls in the hands of the Capenne d’Amou family from Senpere in Lapurdi. Marthe-Madeleine de Saint-Martin, the viscountess, married to Henry Caupenne d’Amou, takes the Baigorriar to Court so as to obtain rights the Etxauzia people never had. The feud goes overboard with the locals ! The 14th and 15th century displays disappear and the Etxauzea lords have to lead a much simpler way of life. On January 23, 1795, Jeanne-Marie-Marguerite Caupenne d’Amou, heir of the title and castle weds Jean Harispe who is the son of a townsman, from Donostei (St. Etienne, which is the main hamlet in the valley of Baigorri). The couple never has any children, so the viscount dinasty dies along with Jeanne-Marie-Marguerite. The last Lordess of Etxauzea passes away on the 10th of February, in 1832. Harispe, who was a Captain in the French Army during the Convention wars, founded the Basque « mountain fighters ». In 1793 and 1794, they beat back the Spanish invaders in the mountains, in the battle that took place in Arrola, precisely. As his military chief’s fame is greatly honored, he will fight on his own, leaving the mountain fighters and joining Napoleon’s troops. He is waged as Count of the Empire, then, as Marshall of France under the Second Empire (1851). However, he doesn’t live in Etxauzia with his wife. He had rather live in the Lacarre castle which he became the owner. The Etxauzia castle is then sold by Jeanne-Marie-Marguerite’s niece in 1848 to a Basque-Irish family, the d’Abbadie d’Arrasts. 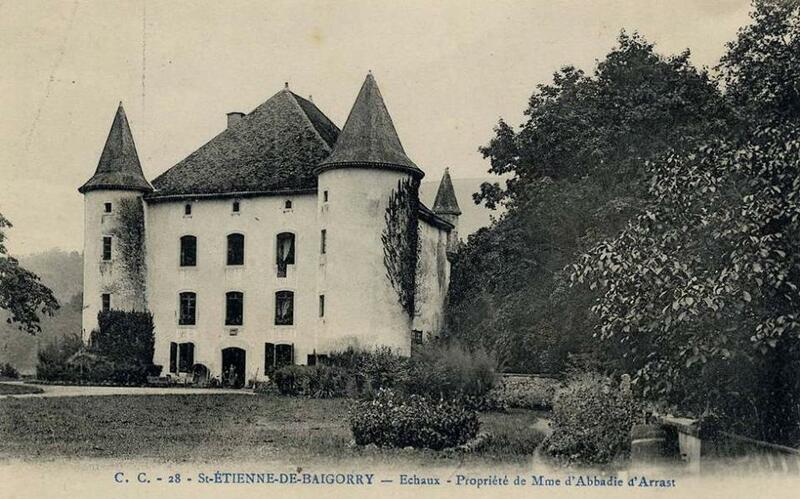 Charles d’Abbadie d’Arrast lives in the castle until he dies in December 1901. Etxauz remains a family estate and is often visited by Charles’ grandson, Harry who works in Hollywood, CA. (USA) as Charlie Chaplin’s attendant at first, then as film maker and script writer from 1920 to 1930. D’Abbadie d’Arrast and Chaplin come to Etxauzia three times (in 1925, 1926 and 1931). Between 1940 and 1944, the castle is requisitioned by the German army that settles its General Headquarters. The soldiers who live there (some of them are Austrians from the Alps and are used to the mountain life. They watch the people smugglers from crossing the borderline). They wrote in German and made murals on a part of a wall that is still visible in the attic of the castle. In 2008, the grandson of one of the soldiers who stayed at Etxauzia came to visit the castle and gave the owners pictures of Etxauzia and Baigorri taken during the Occupation). After the Liberation, the castle, still owned by the d’Abbadie d’Arrats is no longer frequented. Harry d’Abbadie d’Arrast dies in 1968. Eleanor Boardman, actress from Hollywood and Harry d’Abbadie d’Arrast’s widow sells the castle in 1976. Then follow some difficult years : the castle is separated from the whole of the domain. It is sold to local people. It is then sacked, devastated by the new owners (as they’re looking for a treasure belonging to Charlemagne or to the « Templiers »). It stays uncared for in 1994. More than one project has been considered, but none of them has succeeded, for lack of financing and support. However, on December 21, 1989 it is registered in the additional inventory of the Historical Monuments. The Government services being warned of the delapidation of the castle decide that this local heritage monument must be safeguarded. Etxauzia is bought in 1994 by a couple from Baiona (Bayonne). Mr and Mrs Pierné restore it totally and furnish it again. The whole of the restoration works is awarded in 1997. Mr and Mrs Pierné are given the National « Grand Prix » of the Ancient French Homes. Etxauzia becomes a guesthouse : 7 bedrooms are converted ; festive demonstrations are organized (weddings, special events, …). In December 2003, the Pierné couple sells the castle to Mr Azrani who is a businessman from the surroundings of Miami, Florida. His wife is native of Erratzu which is one of the neighboring towns of Baigorri, in Nafarroa. The Azranis are the current owners of the castle that they visit in the summer. They open it to the locals upon night-time markets, tours or on Ikastola school festivals.